When Thalatta is not on charter to schools, youth organisations and social projects she can be used for other activities to help fund the Trust and benefit the wider community. These charters typically include corporate entertainment, company team building, family celebrations, club outings and other group events. Numbers are limited to 12 when she is underway but may be increased to 40+ for alongside static events. As each charter is different, it is generally necessary to discuss the requirements and objectives before being able to provide a firm quotation. Thalatta offers a unique alongside or ‘at sea’ venue for entertaining clients, business associates and/or corporate partners. Our objective is to cater for all needs from the simple to complex. Every client’s requirements are different and we will work closely with them to achieve their desired result. We work with customers to provide a challenging and interesting environment for up to 12 to live on board and work the ship during cruises ranging typically from 2 to 5 days around the coast and creeks of the east Coast. 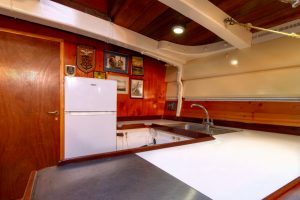 Often this is a combination of on deck activity and academic work in the large, below deck living areas. The objective of each cruise is to ensure that those on board work together as a team and participate fully in working the ship. Everyone is part of the crew – not just passengers. 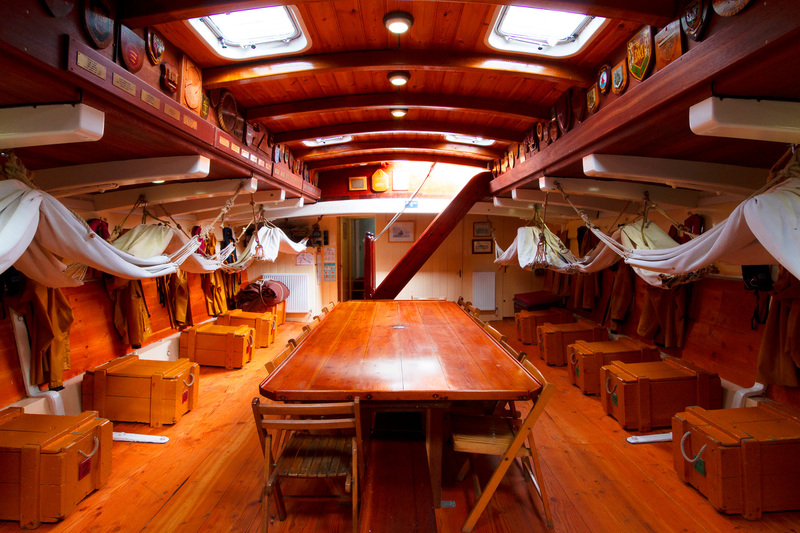 Thalatta’s spacious decks and the wide open area below decks make her an ideal venue for group occasions. In the past we have hosted cricket clubs, surprise anniversary celebrations, pub outings and even pre-wedding celebrations. The outings typically range from day sails to 2 or 3 day cruises. The Thames Estuary abounds with things to do and see. 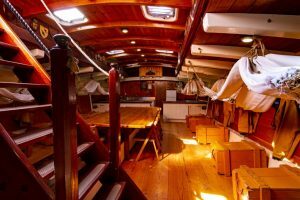 Thalatta’s cruises offer the opportunity for a worthwhile and varied programme of team building whilst giving a glimpse back into a vanished age through the memorable experience of living and working on board the finest of the Thames sailing barges. Thalatta’s programme is always planned to meet the customer’s objectives with safety, interest and variety in mind. A coast or estuary passage is made each day (except in very bad weather), the ship coming to anchor at nightfall in some quiet haven or where there is onshore evening social activity. Normally all cruises begin and end at Ipswich, Suffolk. Occasionally, however, the barge will start at one port and finish at another. Before starting the cruise we will discuss with the customer their objectives and at all times the crew will do their utmost to work with them to achieve their desired outcomes subject only to the Master’s final decision regarding safety of the vessel, it’s crew and passengers. Thalatta is a sea-going vessel 90 feet long and built of oak. A superb example of a fully rigged traditional spritsail barge, she was originally built at Harwich in 1906. Craft of this type developed over the years to combine good sea-going qualities with an ability to navigate easily in the shallow rivers of the south east coast. For many years, in peace and war, Thalatta carried 150 ton cargoes under sail to British and Continental ports. Between the wars, there were 3000 such vessels trading around our coasts – today Thalatta is one of only about 30 surviving wooden coasters in trade. The barge’s sailing rig is nowadays augmented with a modern diesel engine, but otherwise she remains in character and appearance almost unaltered since the days of sail. In trade Thalatta would have been crewed by a Skipper, Mate and Third Hand just as she is today. In 1967 the ship took on a different role as a school ship under the flag of the East Coast Sail Trust. Since then thousands of young people have benefited from the experience of living and working as crew on Thalatta’s five-day voyages. Those coming aboard today assist with the working and navigating of the ship, winding up the anchor, setting the great red sails, and taking a trick at the wheel – few have had any previous sailing experience. 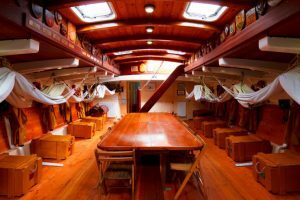 Thalatta’s former cargo space has been converted into communal living quarters with hammocks and wooden sea-chests. 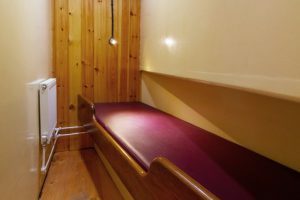 Three separate cabins are provided for the group leaders or those with special needs. 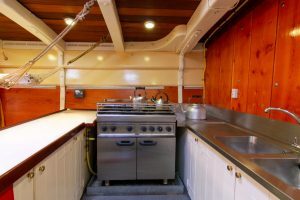 Cooking in the ample galley is on a modern gas stove. 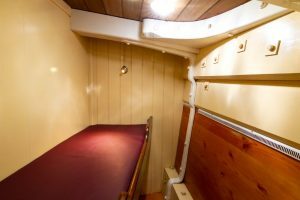 There are two marine toilets, a washroom, a shower, central heating and 240v power. A set of weatherproof clothing and lifejacket is provided for everyone. The ship carries two large ship’s boats, each able to carry 8 passengers. These, propelled either by oars or outboard engines, are used to go ashore, and to explore coastal inlets and creeks too shallow for Thalatta. Thalatta has an unparalleled safety record and the condition of the vessel, requisite modern safety and fire fighting equipment and crew competency are all supervised by the Department of Transport in accordance with the Merchant Shipping Acts. While we operate Thalatta in a traditional manner, sailing wherever possible, she is nevertheless fully equipped with modern navigation tools such as GPS chartplotter and radar.